There’s finally lots of variety of summer stone fruit at our markets – nectarines, several varieties of peaches, apricots and plums. 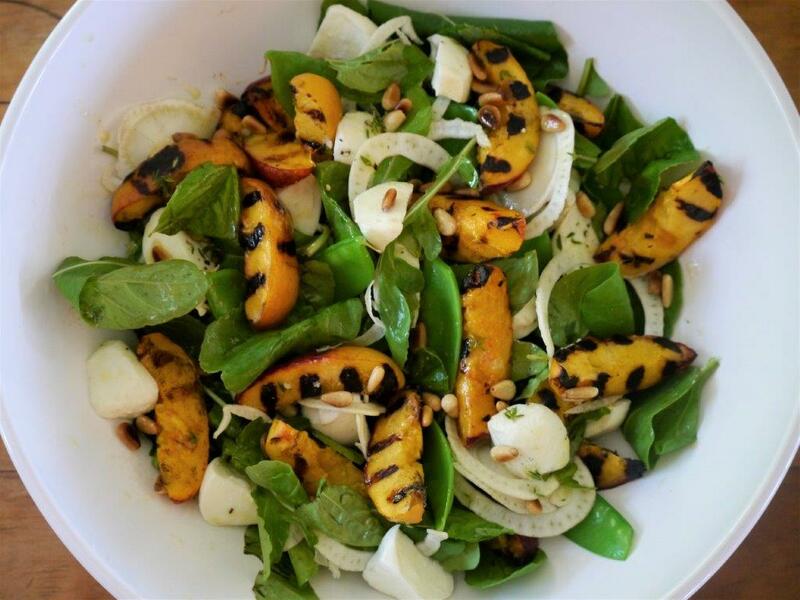 In the summer I like using nectarines and peaches in salads particularly when I’ve grilled them on the barbecue. Last weekend I decided on a salad with grilled nectarines but I’m sure it would work just as well with peaches especially the white ones. Grilling the fruit makes it caramelise and the sweetness comes out. We had this as a light lunch as is. It’d be good with grilled chicken or add some prosciutto or crispy pieces of bacon. Heat the barbecue or grill pan on the stove till hot. Grill the pieces of nectarine until nicely coloured and starting to soften a little. Assemble all the salad ingredients in a bowl or on a platter. Drizzle with the dressing and serve immediately.